This is another bit of a cheat on the theme for the month because I’ve used it before, but I realised when I got in that I had forgotten to soak the beans I’d planned to use today. Kokum was on my list of possibilities of ingredients to use this month though, because I’ve had it a very very long time and only used it twice that I can think of. I bought it in Kerala, where it’s mostly used to flavour coconutty fish curries, which is probably why I haven’t used it much. There’s absolutely no need to worry that this had gone off, no matter how long I’ve had it. As soon as I unscrewed the jar I was met with a delightfully smoky sour pungent aroma. It’s sort of like a chipotle meets a lemon, but there’s no real heat to it. 1. Place the lentils in a medium sized sauce pan, rinse & drain them thoroughly until the water is relatively clear. Add 3 cups of water and bring to a boil (uncovered) over medium heat. Skim off and discard any foam that forms on the surface. Stir in turmeric and kokum pieces, cover the pan and cook on a medium-low heat for about 30 mins, until the lentils are tender. 2. Meanwhile, heat ghee or oil in a skillet, add cumin seeds, until they start to sizzle. (~ 10 seconds). Add in green chillies, garlic and saute until lightly browned. (~ 1 to 2 minutes). Mix in tomato pieces, shredded coconut, salt & curry leaves. Lower the heat and simmer uncovered, stirring occasionally until the tomatoes are completely mushy, but slightly chunky. (~ 3 to 4 minutes). 3. Now, once the lentils are ready, add the sauce prepared in Step 2 and stir. Pour 1 cup of water into the pan to get those extra bits stuck at the bottom, (and pour the water back into the lentils. Cover the pan and simmer on medium heat until the sauce is thickened. (~ 10-12 minutes). 4. Remove the kokum pieces and it is ready to serve. For an even more pronounced kokum flavour, let them cool a bit and give them a good squeeze over the dal. I served mine with the green bean and potato curry from Vegan Indian Cooking, because I had some green beans ready to walk out of my fridge, and a chapati. This dish reminded me of how much I love this spice and what a pity it is that it isn’t more widely known or used over here. Incidentally, in Sri Lanka it’s known as Goraka (or at least, the 2 things are extremely similar), and there’s a delicious cashew curry in Vegan Eats World that uses goraka, so if you happen to have kokum in you could use it instead. Have you ever used kokum or goraka? 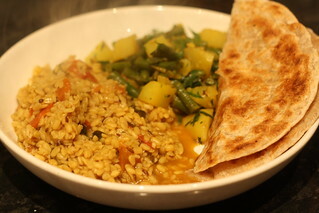 This entry was posted in Vegan Eats World, Vegan Indian Cooking, VeganMoFo 2012 by efcliz. Bookmark the permalink. I’ve never even heard of kokum. I’m so fascinated by your ingredients! 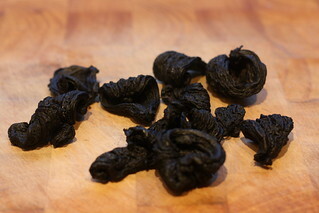 Kokum just came on my radar when I found a recipe for it in 660 Curries. I didn’t buy it though, although now I wish I had!